I am always trying new recipes that feature chicken. We eat it several times a week and get tired of the same recipes, even if we love them the first time I make them. My latest new creation is this basil garlic chicken. 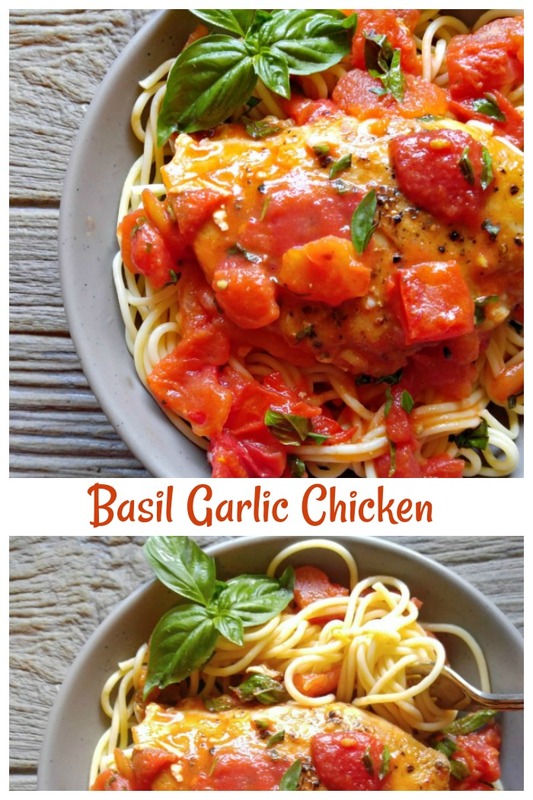 The recipe has a very flavorful sauce that is really easy to make and makes use of late summer tomatoes and fresh home grown basil. It is one of my family’s favorite 30 minute meals. 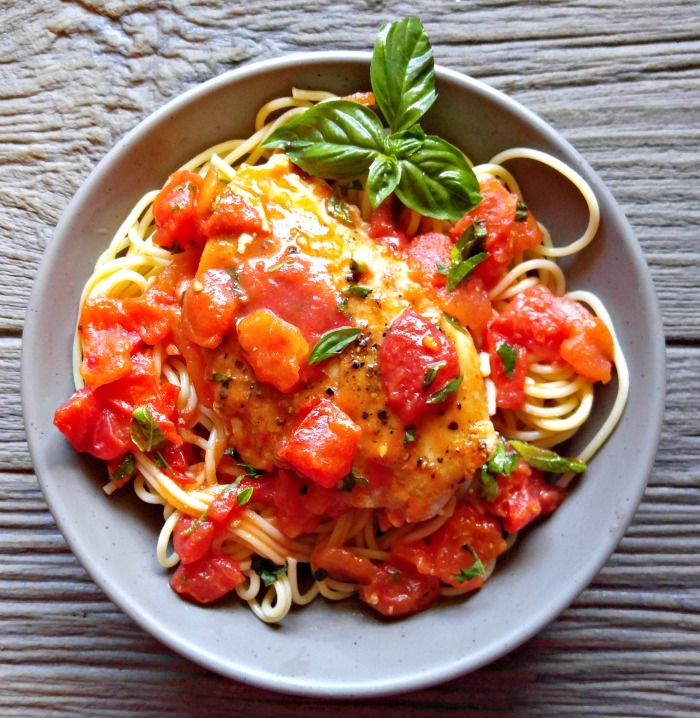 This Basil Garlic Chicken has a rich and flavorful buttery tomato sauce that is sure to please. Fresh herbs add so much flavor to a recipe. My basil plant is almost done for for the year for me. The hot heat here in NC gets the better of it about this time every year, so I picked what I had left of it to use for this recipe. I used a LOT of basil in this creation. I whole big bunch of it to be exact. To get the most out of the flavor, I added it right at the end of the cooking time. 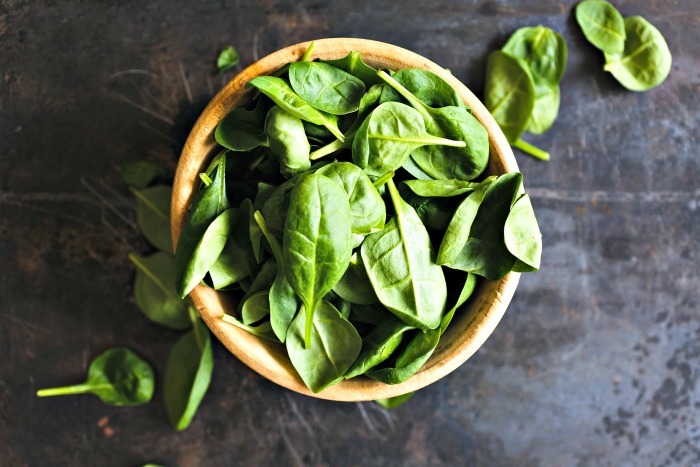 Since basil is the main seasoning for this dish, I wanted to know that I was eating it! The ingredients are really pretty simple. 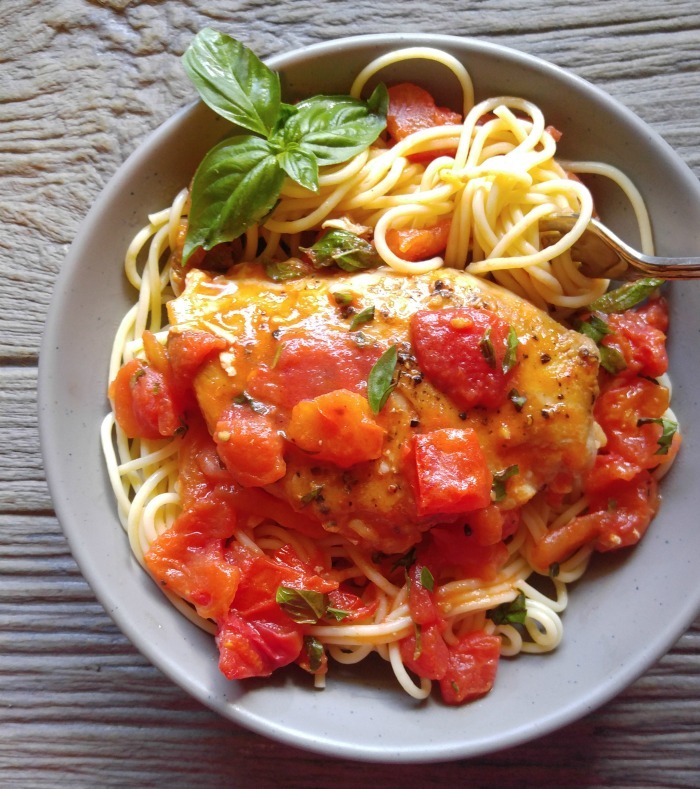 The recipe calls for boneless skinless chicken breasts, Pink sea salt and cracked black pepper, fresh basil, home grown tomatoes on the vine, garlic, extra virgin olive oil and butter. All fresh…full of flavor, but still very simple tastes that go together beautifully. I used herb scissors to chop my basil so it would be ready. I love this kitchen tool. Just a snip snip snip and all that basil is ready to go into my recipe! I started by placing my chicken on a silicone baking mat and covering it with plastic wrap. A few quick whacks with a meat tenderizer made sure that the chicken was evening thick throughout the breast. This is an important step. First, it means that the chicken will cook more quickly. Second, (and most important), it means that the chicken will cook evenly. Cook for about 6 minutes or so on each side, depending on the thickness of your chicken. You will want it cooked and slightly browned on both sides. Remove and keep warm. Cook your pasta in boiling salted water while you make the sauce. Reduce the heat and add your diced tomatoes. Simmer cook them until the tomatoes start to form a chunky sauce. Once the sauce starts to thicken a bit, add in the butter and mix well and then return the chicken to the pan to have a good ole baste in the sauce. I added the diced basil right before I was ready to serve the dish to get the most bang out of the flavor and to keep the bright green color. 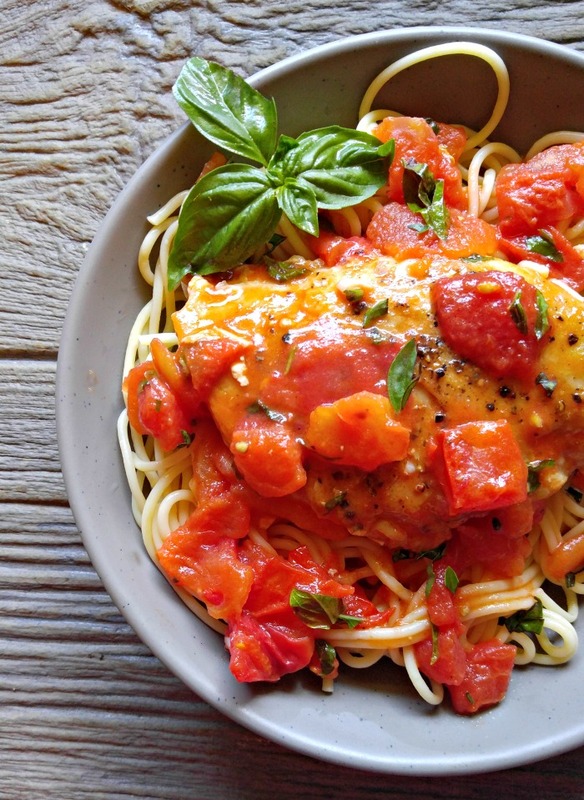 The buttery tomato sauce for this basil garlic chicken is drool worthy. One would not think that these few ingredients could come together to make such a delicious dish in such a short time. You can enjoy this recipe on a gluten free diet by substituting gluten free pasta. Most grocery stores carry a big line of them now. The flavor is subtle but gets loads of flavor from the fresh tomatoes, garlic and fresh basil. Truly worthy of any special occasion, and also perfect for a busy week night. It takes about 30 minutes or so from start to finish. 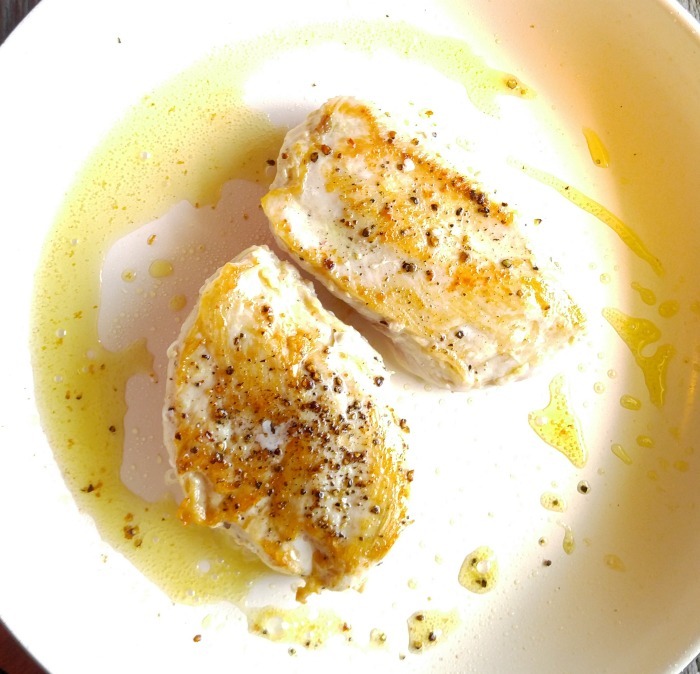 This basic garlic chicken recipe will definitely be a keeper for me. It wins on so many levels: easy to make, elegant enough to serve for a dinner party and A-MAZ-ING in taste. What could be better? Pretty and tasty! Dig in! 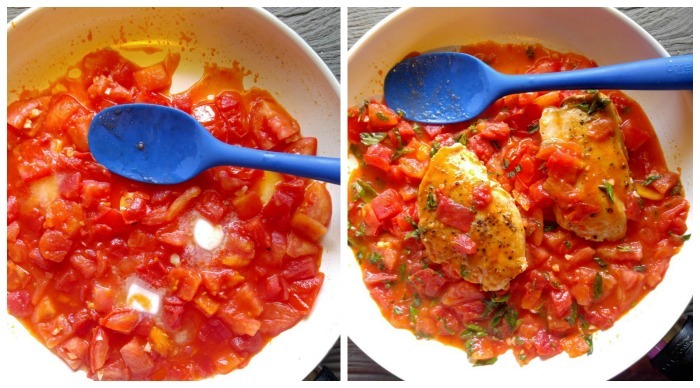 For a reminder of this recipe for buttery chicken in a basil tomato sauce, just pin this photo to one of your Pinterest cooking boards. 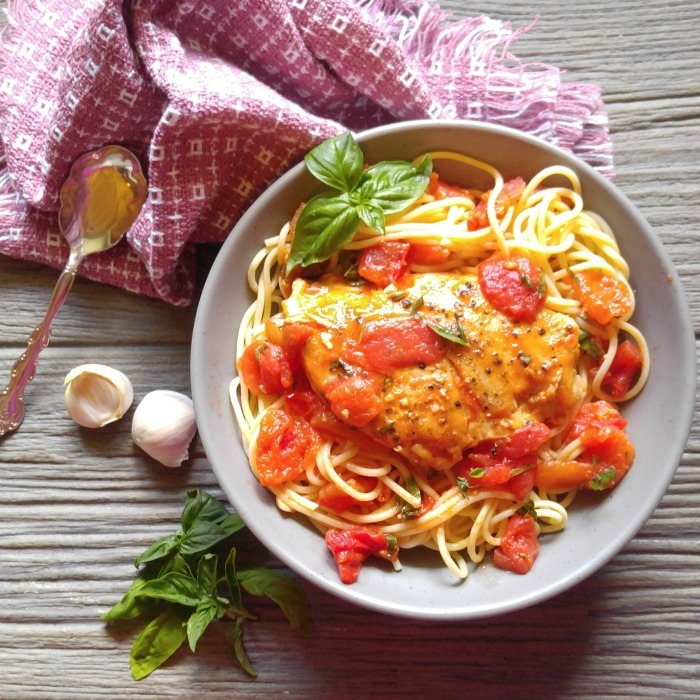 This delicious basic and garlic chicken recipe has a buttery tomato sauce that will make this a family favorite. 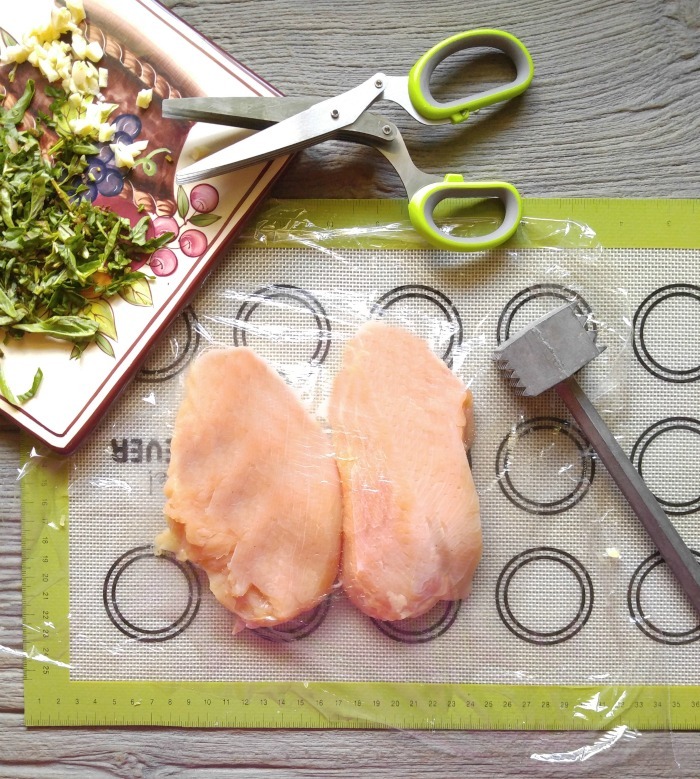 Place the chicken on a silicone baking mat and cover with plastic wrap. Pound each breast to about 1 inch evently thick. Season the chicken with Pink sea salt and cracked black pepper. 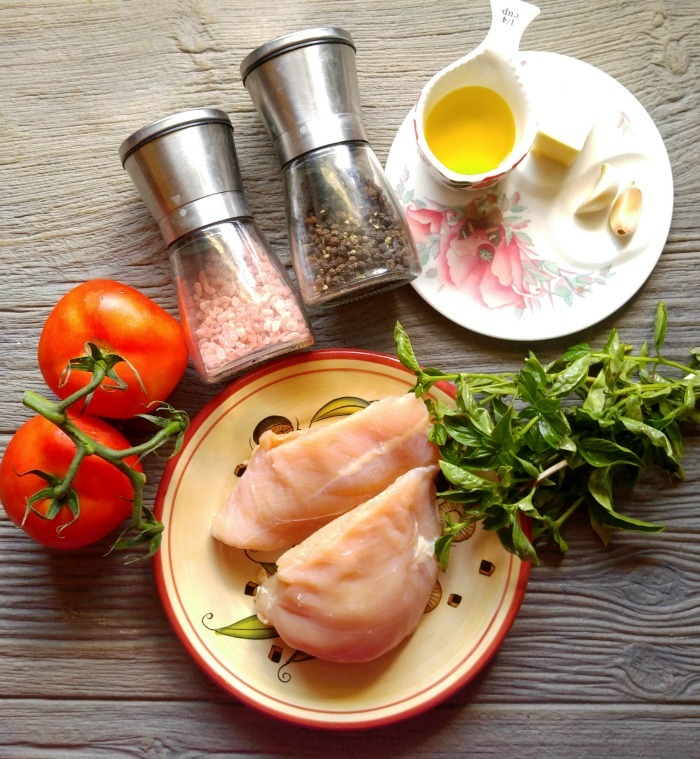 Heat the olive oil in a large heavy non stick skillet and cook the chicken for several minutes on each side so that the chicken is cooked and lightly browned. (about 10-12 minutes total.) Set the chicken aside. Boil water and cook the pasta according to package directions. Let the oil cool a few minutes and add the tomatoes. Simmer the tomatoes until you end up with a chunky texture - about 10 minutes or so..
Stir in the garlic and butter and cook until the butter has melted. Return the chicken back to the pan and cook a few more minutes. Right before you are ready to serve the meal, stir the basil into the sauce. Place the chicken breasts on the cooked pasta and spoon the sauce over all. Enjoy!